Posted February 9, 2014 by knappier & filed under Healthy Eating. It’s the weekend and my favorite thing to make on a lazy Sunday morning is pancakes. But not just any pancakes, warm banana pancakes. This is my go to healthy pancake recipe that couldn’t be any simpler. Place the ingredients into your food processor or blender and blend until all is completely incorporated. Then pour the batter into a well greased pan over medium/low heat. Because these brown up quickly make your pancakes fairly small and be careful not to over cook them. Flip when they start to set and bubble around the edges. Top with your favorite healthy toppings. I love a little coconut oil and almond butter. These are great with just the 3 ingredients but feel free to get fancy and add in whatever you like. I’ve tried adding vanilla extract, crushed walnuts, shredded coconut and dark chocolate chips. If you’re in the mood for a less sweet pancake these can also be made with 1/3 cup of canned pumpkin or squash instead of banana. Posted January 5, 2014 by knappier & filed under Health, Workout. I don’t think I’ve ever seen this much snow before. Every couple of hours I go out to shovel our walkways and around the cars but by the time I’m done it’s completely snow covered again. I guess I’m staying in today and by the looks of it tomorrow too. If one of your New Years resolutions was to start working out or to be more active don’t let the bad weather keep you from it. You don’t need the gym to get in a good workout. Here’s one you can do at home with no equipment at all! All you need it a clock, timer or interval timer app and a little space. The whole workout takes only 10 minutes but I challenge you to complete as many rounds as you can. Three rounds is only 3o minutes of your day. If you do the workout, leave a comment and let me know how many rounds you were able to complete. Stay safe out there today. Posted October 9, 2013 by knappier & filed under Health, Healthy Eating. Fall is finally here and the stores are filling up with pumpkin flavored everything. For those of you who don’t know pumpkin is my all time favorite flavor. But to keep myself from being tempted to buy all those overly priced, artificially flavored pumpkin things I find ways to make my own healthy versions. This morning was perfect for pumpkin waffles and hot coffee before hitting the gym. This recipe is very filling and has a ton of healthy protein and fiber. Top with your favorite healthy toppings. I used a little almond butter, cinnamon, honey and organic whole milk yogurt. It was amazballs! What are your fall favorites you can’t live without? Posted September 24, 2013 by knappier & filed under Healthy Eating. Just because you’re trying to eat healthy doesn’t mean you have to deprive yourself of all indulgences. 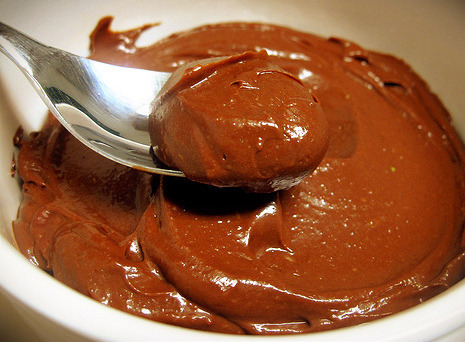 One of my favorite desserts you can make in no time is avocado chocolate pudding. Place all of the ingredients in a food processor and blend until completely incorporated. Then let it chill the fridge for at least an hour. It will form a skin on it like regular pudding so place a piece of plastic wrap on the surface of the pudding to keep that from happening. Posted September 11, 2013 by knappier & filed under Health, Healthy Eating, Nutrition. Every where you turn companies are claiming their products are all natural, low fat, organic, and locally grown. But what does it all mean, really? Here’s your quick guide to deciphering those food marketing claims. Really…natural Cheetos? They have to be kidding. Low Calorie – 40 calories or less per serving. But make sure to check how much a serving is. Read more about that here. Natural – The FDA does not restrict the use of the term ‘natural’ except for foods with artificial flavors, chemical preservatives and added colors. That means, ‘natural’ has no legal definition and is left up to manufactures to decide. That’s never good. Free Range – This term is only reserved for poultry. It’s defined by the USDA as ‘poultry that has been allowed access to the outside.’ The term ‘cage-free eggs’ bears no actual legal definition. To be sure that your eggs and poultry are truly free range, buy them direct from the farm at a farmers market. Organic – This term is regulated by the USDA and means that pesticides or fertilizers were not used in the food’s production and that it contains no genetically modified organisms. When the ‘Organic’ symbol is used on a package that means at least 95% of the ingredients in the food are organic. If it says ‘Made with organic ingredients” it means at least 70% of products are organic. Local – Refers to where the food was grown/produced not consumed. There are is no real guidelines on the term so it’s up to you to read the labels and ask questions. The US Congress has defined ‘local’ as a product that is less that 400 miles from it’s original origin or within the state it’s produced. Whole Foods defines it as, foods that have traveled seven or fewer hours by car or truck. Posted September 4, 2013 by knappier & filed under Health, Healthy Eating. I’m sure by now everyone knows to check the nutrition facts on the food you’re buying at the grocery store but what is it you should be looking for? I know it’s confusing, but I’m here to help. Here are my top 5 things to look for when reading those nutrition facts. This is a biggie that trips most people up. When comparing items like granola or cereal in the store one box may seem lower in calorie but check the serving size. It’s probably much smaller. Or on that ‘snack sized’ bag of chips, really check how many servings are in there. If there are 3 and you eat the whole thing you’re tripling the calories on the label. Pay close attention to these. The latest recommendation for sodium is 2300mg per day for adults and even less for kids. Canned foods are a big culprit here. As for sugar, the less the better. Check the ingredient list to see where it’s coming from too. Is it sugar, honey, artificial sweeteners or *gasp* high fructose corn syrup!?! Just stay away from any foods that contain HFCS. Almost everyone I talk to about their diet could use more protein. It’s a very essential maconutrient that a lot of people over look. Depending on your fitness goals and activity level you need .5 – 1g of protein per pound of body weight every day. At the bottom of the nutrition facts is the ingredient list. Ingredients are listed in the order of quantity. So if sugar is first on the list put that thing back and pretend you never picked it up in the first place. Also, the shorter the list the better. Food writer Michael Pollan is famous for saying, “Don’t eat anything your great grandmother wouldn’t recognize as food.” And I completely agree. Lastly, if you have a food allergy food labels are now required to list if they contain or may have come in contact with the top 8 food allergens (milk, eggs, peanuts, tree nuts, fish, shellfish, soy and wheat). This is also important to check if you’re trying to avoid gluten, dairy and/or soy in your diet. It seems like a lot of things to look out for but it’s the only way to know exactly what you’re putting in your body. To make it simpler, just buy foods that do not require a label. Like fresh vegetables, fruits and high quality proteins. Your body is like a sports car. If you put cheap, low grade fuel in your body you’re going to run like crap. If you fill yourself with the best fuel possible you’ll feel great and run like a dream. Would you dump sugar in your gas tank? I think not. Your body is exactly the same, but unlike a sports car you can’t replace your body if you reck it. So treat it well, it’s the only one you’ve got. Posted April 27, 2013 by knappier & filed under Healthy Eating. What to do when Trader Joe’s is out of your favorite almond butter? Make your own! It didn’t take long, there’s not many ingredients and I think it tastes even better than Trader Joe’s. You do need a high powered blender. I tried using my small food processor and it wasn’t strong enough, but when I switched to my Nutribullet blender I had no problems. Using the milling blade, I blended 1 cup of almonds at a time until it was like flour consistency then I added in the oil, sea salt, honey and cinnamon until it was creamy. It took about 25 minutes of blending. Posted April 21, 2013 by knappier & filed under Healthy Eating. Sunday meal prep time again! This week I’ve got cajun seasoned chicken, assorted vegetables and kale salad all portioned out and ready to go. For snacks I’ve got hard boiled eggs, apples, turkey jerky and almonds. I always feel so accomplished when I see all my food done and packed up for the week. What do you have planned for the week? Posted March 3, 2013 by knappier & filed under Healthy Eating. One of the biggest misconceptions that may be sabotaging your diet is that low-fat and fat-free foods are healthy. Many low-fat foods contain the same or even more calories than their full-fat counterparts because they have to add extra sugar to make up for the loss in taste that happens when they remove the fat. One of the best examples of that is in yogurt. You are much better off enjoying plain full fat yogurt than any of the low-fat/non-fat varieties. There is no reason to buy yogurt with added sugar and artificial sweeteners especially if you’re trying to lose weight. If you like a sweeter yogurt add in your own fruit instead. Yikes! That’s a ton of sugar and a lot of ingredients. • When buying a large container make sure to check what the serving size is. It varies from brand to brand. This is my favorite brand of yogurt. It tastes great and comes in an awesome glass bottle. It’s made with whole milk from 100% grassfed cows and is from the only nationally distributed 100% grassfed organic dairy. You can find it at Whole Foods. This is my next go to yogurt. It’s nice and thick and very affordable. Posted February 21, 2013 by knappier & filed under Health. It looks like we’ve got a pretty serious snow storm on the way. I was hoping we were over all this winter weather. But don’t use the bad weather as an excuse to not work out today. Shoveling snow can really burn some calories! Calculate how many calories you’ll burn from shoveling snow. Before you head outside here are some things to remember to keep you safe. Stretch out and warm-up before you start shoveling, just like you should before any workout. Stay hydrated. Even though it’s cold you’ll still be working up a sweat. Most importantly, use good form! So many people hurt their backs from shoveling snow. Don’t be one of them. If shoveling snow is not in the cards for you today you can still get your workout in at home. Give one (or two) of these home workouts a try. If you do, post how long it took you to finish in the comments.